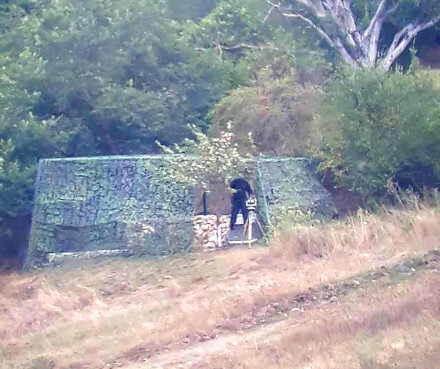 TBILISI, DFWatch–Locals have discovered a new surveillance post near Koda, a village along the perimeter of South Ossetia, where Georgia and Russia fought a brief war ten years ago. The observation post near the village of Koda, which likely includes a telescope that is able to track movements in nearby villages, is further proof for locals of how the Russian soldiers are digging in and reinforcing the de facto border. Russian border guards who are charged with protecting the boundaries of South Ossetia and the other breakaway republic, Abkhazia, have installed a telescope in a reinforced position near the conflict line in order to monitor the movements of the anti-occupation group and ordinary people, journalist and group member Lasha Berulava wrote on Facebook. The Russian military frequently pass through territory controlled by the Georgian government, arrest locals and bring them to the breakaway capital Tskhinvali, where they are not released until after paying a 2,000 rubles (USD 30) fine. Tskhinvali issued a statement in June announcing that it was establishing a special commission charged with revising the ‘border demarcation with Georgia’. In particular, Tskhinvali is discontent that after the installation of barbed wire fences, lands rich in mineral deposits fell inside Georgian controlled territory. These lands legitimately should have been included in South Ossetia, the breakaway authorities claim, andplan to ‘correct the mistake’, which means that a 150 meter long strip of road connecting two Georgian villages in the Kareli district, Koda and Abano, will be cut off, leaving the latter as an isolated enclave. Another part of the plan involves seizing a small area of land that contains an open-cast dolomite mine. After the plan was presented, Russian border guards have stepped up their presence in the area.